Send sound from any app on your iPhone or iPad to any speaker in your home. Use your iPhone or iPad to control synchronised multi-room music - without your mobile device needing to stay connected. Play music from your PC/server on your iPhone or iPad. One or more Raspberry Pi computers (in fact you can use any computer but this article covers the Pi). It will also work with an Airport Express or Apple TV. Powered speakers connected to the Pi's 3.5mm analog stereo jack. Either an ethernet connection or a wifi adapter that will work with Raspbian such as the Edimax EW-7811UN. An iPhone/iPad with Apple's Remote app. In this reciple, the server is on all the time, and is where you store all your music. 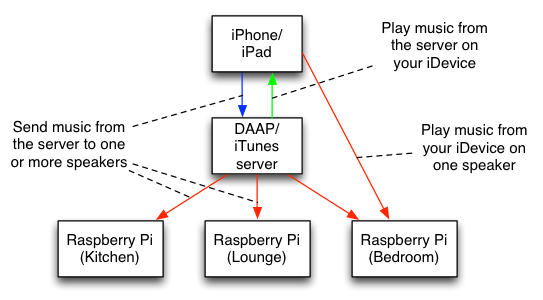 The server uses a protocol called DAAP to provide information about your music library (Artists, albums, tracks, cover art etc) to your iDevice, and can be controlled by your iDevice to send music to AirPlay speakers. If you have a desktop PC or Mac then you can use that as your server, simply by having iTunes open. You need to setup iTunes to share your library and allow it to be controlled by your iPhone following Apple's instructions. If like me you don't have an always-on iTunes-capable computer (all mine are laptops), then you can use any cheap computer (including a Raspberry Pi) running Linux and DAAP software. I use an HP MicroServer, but a large number of NAS devices will run forked-daapd (the software I will use in this article) and Synology NAS devices come with this functionality in their DSM software. There is a large amount of good information about the version I use from the author, so I shall not repeat it. See his instructions for installing and setting up the software on a Raspberry Pi (yes you can use a Pi for the server as well as the AirPlay speakers), but his github project page also has instructions for compiling it from source to use on any Linux distribution. The README page tells you how to set up your iDevice's Remote app to work with the server. Change the hostname of your Pi (e.g. call it "bedroom"). Expand the operating system to use all the available space on the SD card (otherwise you might run out of space). Change the password for the default user "pi". Force your audio to analog (you probably don't need to do this). If you use a wired connection, you can skip this step. You will want to set up your USB adapter so that it automatically connects to your home Wifi network. If you see a paragraph about wlan0, your device is available. If not, look online for how to install the drivers. Once you have networking set up correctly, you can disconnect the keyboard and display and follow the remaining steps by logging into your Raspberry Pi from another computer via SSH. If you have a Pi model A or A+ and are using wifi you will likely have to do this because you only have one USB port - which you will need for your Wifi adapter. To connect via SSH, follow the Raspberry Pi Foundation's instructions. The popular shairport software emulates an AirPort Express on Linux, and it is this that receives audio from your iPhone or your server and sends it to your speakers. There are a few versions of shairport, I use a derivative called shairport-sync. it is a bit more responsive - music plays quicker and it responds to volume changes quicker - and will synchronise music playing in different rooms, which is great for multi-room audio. The disadvantage is that, unlike shairport, you will need to compile it from source. This step tells the software to use the hardware volume control on your Pi's internal sound card instead of the default, a lower quality software volume. It also sets the name that will be shown when you are choosing which speakers to send music to. It is not necessary, but recommended. Obviously you would replace "Kitchen" with the name you want to use. Once you have your AirPlay Pi up and running, you can test it by sending some music to it from your iPhone. In iOS 7 and 8, swiping up from the bottom of the screen brings up a dashboard with an "AirPlay" option. Tap it, select your Pi from the list. Sound from any app - such as Music or Podcasts or Spotify or YouTube - will be output on the Pi's speakers instead of the iPhone. You can see some screenshots of this process on Apple's AirPlay support article. Remember, your Raspberry is emulating an AirPort Express so the process is exactly the same. The music does not have to be on your iPhone. Music is sent directly from your server to the AirPlay speakers, so music will continue to play if you close the Remote app or turn your iPhone off. You can select multiple speakers at once, to play music in multiple rooms. If your server is a PC or Mac running iTunes, you can simply enable the Home Sharing function to stream music from your server and play it on your iDevice in the Music app. Home Sharing replaces an earlier mechanism of doing this, and depends on your Apple ID which unfortunately means cannot be supported by forked-daapd. Therefore if you're using a Linux server you will have to use a different app like Simple DAAP Client. Hi, thanks for your awesome article. I´m wondering, if your raspberry is also auto of sync with the other airplay speakers? This case orrcures by playing music via forked-daapd, only. When I stream music from (e.g.) iTunes to my Airplay-Speaker and the Raspberry pi Airplay, they are perfectly in sync. (On my raspberry pi is shairport-sync installed). I expect you will need to set the "default" timing to be something else and see how it affects the synchronisation. If you do find a good value you could suggest to Mike that he modify shairport-sync to automatically set it when it detects forked-daapd via the User Agent header (the User Agent is forked-daapd/<version>). I faced similar problem. I solved it with empirically discovered --latency parameter of 102500. First, thanks a lot for this tutorial. I have a issue with daemon, when reboot don´t start shairport-sync. [FAIL] shairport-sync is not running ... failed! Hi - first of all, thanks for the excellent article, it made installing shairport sync a doddle! Trouble is I'm hearing a lot of hiss when streaming music to my Pi. Is this normal? I heard it on my stereo but it's more obvious if I plug headphones into the Pi. I'm using a Raspberry Pi B+ and hear the hiss whether I stream from my MacBook or iPhone. I seem to recall one of my Pi's (either an B+ or A+) did have some hiss, audible especially when outputting silence. I started to investigate but in the end I changed my plans and used an original model B, and that was much better so I didn't need to. The model B has a dedicated audio out port, in contrast to the shared video-audio port on the B+ and A+. My first suspicion would be the grounding of the 3.5mm cable. Make sure yours is the correct type and doesn't mix the ground and video pins - unfortunately different devices use different pin configurations rather than there being a single standard order. There are some diagrams on the web. Will have to try the old B model, but I'm sure I heard the sound was even worse on that. Thanks for your help and a great article! Hi - great tutorial. Can I ask please, if the program is updated on Github, how do we update it on the Pi? thanks for the tutorial and the good introduction to multiroom audio! If anyone is looking for some preinstalled Airplay/Squeezebox Image that has additional features and comes with a webinterface to easy control everything you might have a look at Max2Play (http://www.max2play.com). Together with Squeezeplug and HiFiBerry there are some special releases for the Raspberry PI that work very good out of the box. Looks like the audioplayer part is actually a paid extension (10 euros), please correct me if I'm wrong. The system looks to be an "all things to all men" bundle of lots of stuff. Personally I am wary of such projects as they rarely excel at everything. So if anyone tries it, I would be curious if the timing options are correct for synchronised multiroom audio, if it's stable etc. insserv: script shairport-sync is not an executable regular file, skipped! Can the DAAP server also play music? Thanks for the great tutorial; I'm looking forward to trying it out. I hope to use a Raspberry Pi with forked-daapd as the server. I was wondering, is there a way to use this Pi with forked-daapd as both the server and an additional receiver? i.e., Could I install shairport-sync on the same Pi that is running forked-daapd and have it give me an additional set of speakers? You could, but forked-daapd (which you control with Remote) can send output to either the "local" audio out or to remote AirPlay speakers. So it may be that the speakers appear twice which could cause some issues. Why not try it? I followed your guide for compiling and installing "shairport-sync" and did need to copy the ~/shairport-sync/scripts/* into my /etc/init.d/ directory after which I started the service and found my sister's mac recognized and was able to use the Pi as an airplay speaker. I don't use pipe so I can't answer your question specifically, but if you look at what I wrote you'll see that I put the config options in the init script and don't use the with-configfile option either. If you run update-rc.d as I mentioned then this init script will be launched at startup. So have you tried just editing the /etc/init.d/shairport-sync file with the options you want? You might run into trouble with the syntax for "--" because start-stop-deamon also uses that syntax to distinguish program arguments from start-stop-daemon arguments. the syspem says:" autoreconf: 'configure.ac' or 'configure.in' is required"
Thanks so much for the instructions. Awesome. I am, however, unable to start forked-daapd on boot and can only start by service forked-daapd force-reload. I have tried editing rc.local (ugly fix I know), changing the users in the init.d and config files, and changing user permissions, but still no dice. Afraid its very difficult to troubleshoot from here, but do the logs show anything. If you've been starting it manually and messing with changing users and different permissions then it could be permissions on the log file etc. Check the configured user is able to write to the file you specified and the directory it's in. Also make sure that the init script is actually scheduled to start (i.e. at the appropriate runlevel). If the defaults in the init script are wrong or you never ran update-rc.d to install the symlinks then it simply won't execute the init script on startup. autoreconf: alocal failed with exit status: 1"
I cannot figure out what this means and how to run the autoreconf action. Can someone please help? Thanks! It sounds to me like a permissions problem. Are you sure your user is the owner of the shairport directory? You didn't download it or run anything inside it with sudo or as root? this is so simple and so coool. I just wanted to know if it still works. I am planning to make multiroom system with my RPIs. Honestly, I am not sure. I don't use it any more since I switched to Google Play Music + Chromecasts and mostly Android devices. I suspect shairport still works, whether the instructions will work exactly as written I have doubts.